Our clients include associations, foundations, faith based organizations, & higher education..
We focus on team building, ethical leadership, conflict management, risk management, and brand awareness..
A strengths based approach to strategic planning, that leads to opportunities, aspirations, and results. Meet the Leadership Outfitters team. 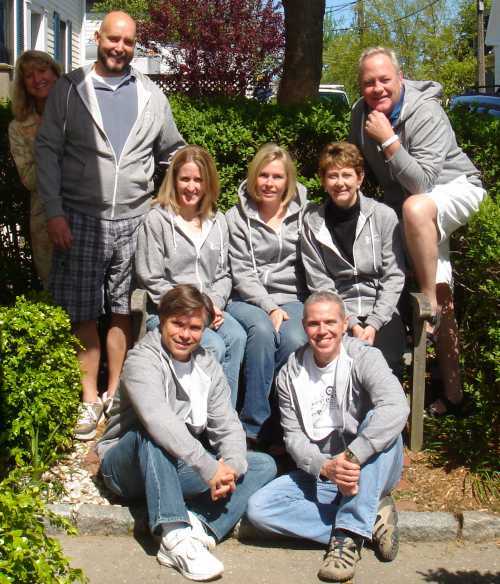 Leadership Outfitters has offices in L.A., D.C., Boston, Eugene Oregon and Hartford Connecticut. Provocative Ideas for Practical Implementation. We approach the strategic thinking process with a strengths-based mindset grounded in our own doctoral research. We use a proven multi-phase process of ongoing conversations, stakeholder data collection, process design, and an interactive style of strategic thinking/planning facilitation. The onsite strategic thinking is supported by an action document for future implementation and follow-up support to refine plan implementation. 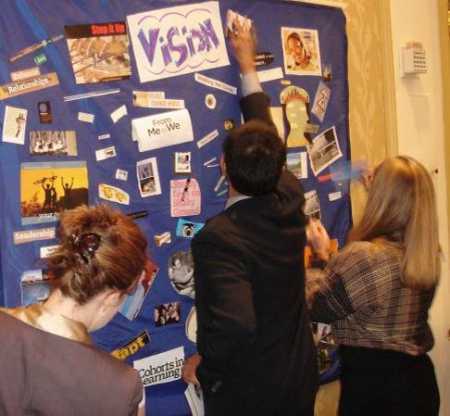 In addition to the traditional leadership composition, we strongly recommend adding “guests” or “strategic wild cards” to the process to provide new perspectives or ideas. In the weeks leading up to an onsite dialog, we will work with the organizational leadership team to refine deliverables and the data collection process. 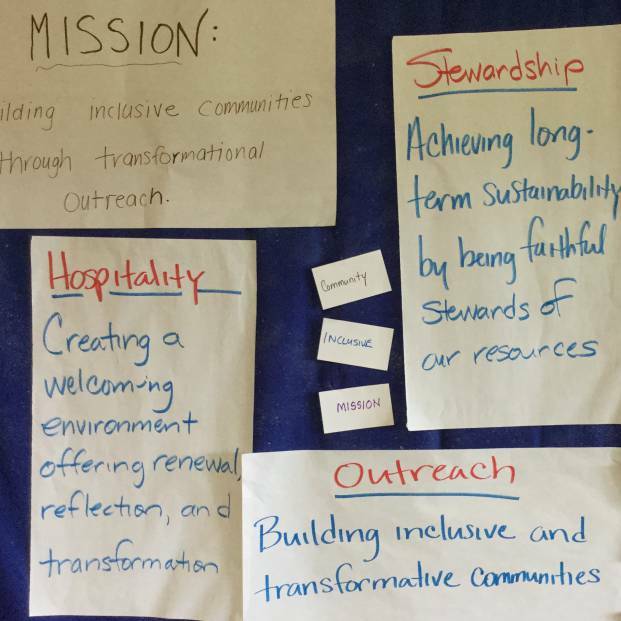 The goal of the stakeholder surveys is to capture a variety of perspectives on strategic direction for both the volunteer leadership and professional staff. It is the intent for these surveys/data-collection tools to be designed with brief qualitative questions that will help provide insight and strategic direction for the organization. We typically recommend the following core content elements for the strategic thinking process. These may be adapted based on new data or input from the stakeholders. 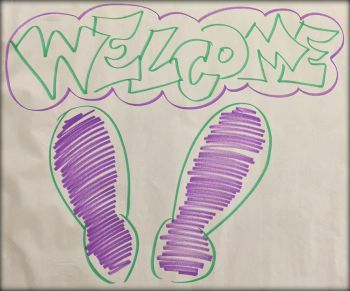 Our process begins with drawing out potential filters or barriers while establishing an environment where ideas flow. 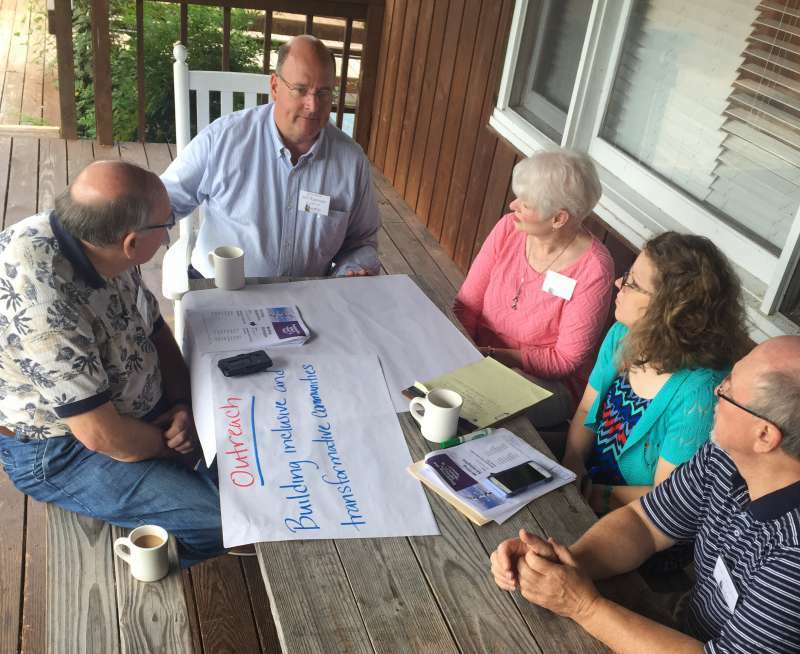 After a variety of ideas are shared, they are refined in small group discussion teams. Our goal is to provide multiple opportunities for the team to address sensitive issues and future direction in a purposeful way. Below is a general outline of our process we’ve used successfully with multiple client systems. Train Whistles/Change Catalysts – This activity explores change catalysts that may affect future organization operations as well as evolving market and growth demands. The catalysts/trends identified in this segment may be internal or external in nature. SOAR Framework – This process is very similar to a SWOT (strengths, weaknesses, opportunities; threats) analysis but takes an Appreciative Inquiry approach to identifying the “bright spots” of the organization and how these bright spots might be replicated in other areas. SOAR stands for: strengths; opportunities; aspirations; results (measurements/benchmarks). Key issue review/update – The group evaluates the current key issues and determines if they are still relevant based on the Train Whistles/Change Catalysts and SOAR Analysis. Are there new key issues emerging? Goal review/update – This step allows the strategy group to explore a deeper dive on the newly reviewed/updated key issue areas and for the existing goals to be reviewed or expanded/edited as needed. In most cases, we recommend dividing the group into key issue areas, based on where they have the most interest and passion. Following the onsite dialog, we will compile all the content that was generated and produce a preliminary report. This report is based on the work from the earlier phases and is provided at no additional fee. We will work with the organization’s leadership to refine the follow-up report to establish a work plan with tactics, timeline, deliverables, strategy leads and review expectations for successful implementation. The purpose of the doctoral research in 2013 was to explore the strategic planning application of the SOAR (strengths, opportunities, aspirations, and results) framework grounded in the Appreciative Inquiry literature through the lived experiences of non-profit executives leading professional societies, foundations, or trade associations on a strengths-based strategic planning process. The purpose of this grounded theory using phenomenological interviewing techniques was to determine whether non-profit executives working in professional societies and trade associations changed their individual thought processes or adapted organizational management practices by applying the strength-based principles of the SOAR framework. The research was conducted through Pepperdine University’s School of Education and Psychology in Malibu, California. What are the lived experiences that have resulted in changed behaviors as a result of the awareness and application of SOAR in the strategic thinking process? What are the lived experiences that have resulted in changed mindsets as a result of the awareness and application of SOAR in the strategic thinking process? 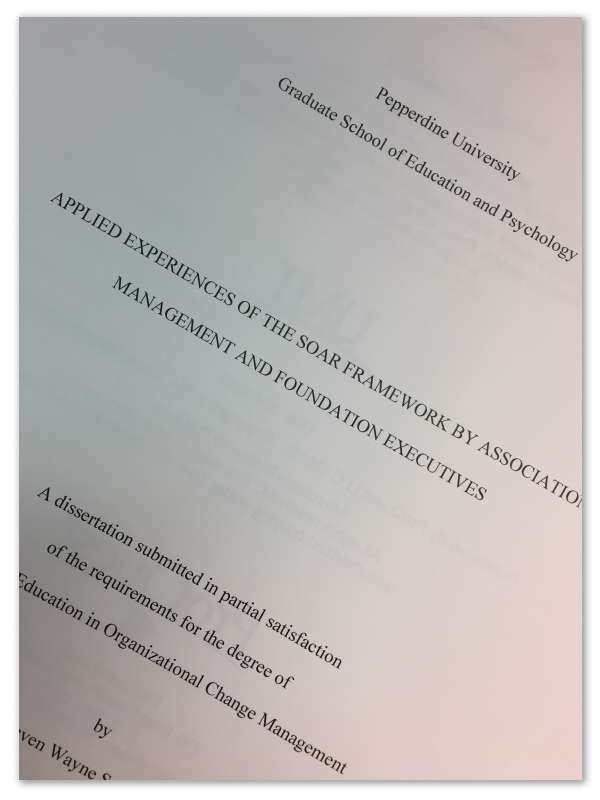 The qualitative study using a phenomenological frame for the semi-structured interviews sought to explore and document how the SOAR Framework has been engaged in professional societies, foundations, and trade associations. 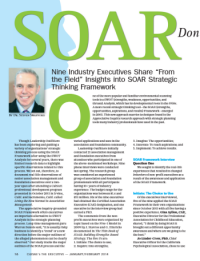 This SOAR framework research aimed to add to the body of understanding and knowledge of the SOAR Framework resulting in expanded individual and organizational application of this appreciative inquiry grounded approach. The study also documented comparisons between the traditional strategic planning SWOT (strengths, weaknesses, opportunities, and threats) analysis and the strengths-based SOAR framework by the non-profit executives involved in this two-year study. While our primary offices are in Washington, DC and Los Angeles, we have multiple team members regionally to support our collaborative client work.